The artificial sun that lights the frozen planet La Metalle is dying, threatening to extinguish what little life is left there. Queen La Andromeda Prometheum decides that the only way for her people to survive is for them to submit to Hardgear's transformation process, which will turn everyone's body into machines. The Queen's daughters, Emeraldas and Maetel, refuse to submit to this process, and fight to stay human. 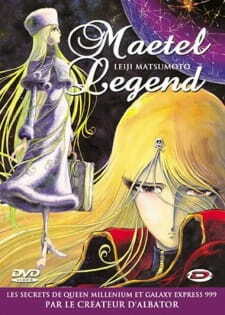 The Maetel Legend ova tell the story of teen sisters Maetel and Emeraldas as princesses of the planet La metalle and their fight to remain human despite the hardship that faces them.The ova also shows the the history of the mechanization empire and how it came to being in very good detail. The animation is typical Leiji Matsumoto drawing style, but given a slightly more vivid look due to it being a more modern title.There wasn't a great deal of music in this anime and what there was isn't worth mentioning. One word to summarize the characters in this anime would be functional.There not great or terribly bad,they fill there roles without being memorable.Most of the scenes are shown of a few characters mostly Maetel , Emeraldas,Queen La Andromeda Prometheum and Hardgear. The plot is straightforward story-telling and at time just seems dead and uninspiring.Unlike earlier 999 works,there is no real memorable moments in this ova,its just there to fill its purpose of giving insight of Maetels origin and the mechanized empire.Even though the plot is pretty simple its still not without its flaws,such as; despite the fact that the people of the planet La Metalle being close to destruction due to the extreme temperatures,they still waited till their situation reach critical and didn't just leave the planet even though they had the means to do so. Overall although unspectacular its still a must watch for any fan of the galaxy express 999 franchise.